Although born and raised in the South, Fr. Martin Watt’s path to Orthodoxy would take him East to the ancient faith and the holy priesthood. Born to Methodist and Baptist parents, Fr. Martin was received into the Methodist Church where he became the only person to fail his confirmation class. At the young age of only 11, he declined confirmation into his father’s Baptist church and was confirmed a Methodist by way of the pouring of water on his head. Only a year later, his parents decided the entire family could better serve the Lord as Baptists and once again, Fr. Martin underwent baptism, this time by way of full immersion. In what could have been a sneak preview of becoming Orthodox, this baptism was his third. 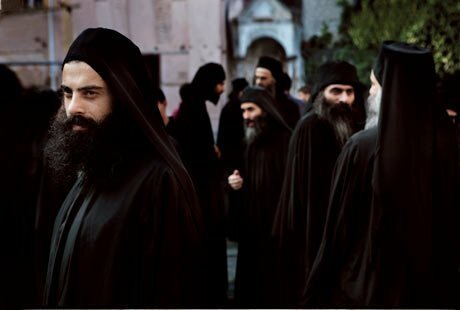 Orthodox doing everything in threes. By his early teens, Fr. Martin felt his first calling to serve the Church. He preached his first sermon when he was 15; it wasn’t his best moment. He went on to attend Middle Tennessee State University where he aspired to be a recording engineer, having worked at an AM Radio station prior to college. After discovering the low wages of recording engineers, he decided to pursue a different career path. He became interested in a legal career after talking with a friend from Harvard Law School. During this time, he no longer attended church. The Baptist Church was suffering from a split between conservatives and moderates and the split was very unpleasant. Although his faith did not falter, his connection to the church did. Upon graduation from college, Fr. Martin accepted a job offer in Kingsport, Tennessee. He also married his high school sweetheart and they welcomed a daughter in 1991. A job transfer later in the year would take the Watt family further south to Fort Lauderdale, Florida. Culture shock quickly set in and to relieve some of it, Fr. Martin and his wife sought refuge in the familiar environment of the Baptist Church. They joined a small mission church and while they enjoyed the experience of it overall, Fr. Martin yearned for a more meaningful form of worship, something reverent. He also wanted to learn more about how to grow beyond the initial step of salvation, something his former churches taught little to nothing about. Wanting to know more about how different faiths encouraged the practice of faith on a personal level, Fr. Martin joined a roundtable discussion group. Unable to accept the monarchial Catholic Church or the splits that were rocking his former churches as well as the Episcopal and Lutheran Churches, he finally connected with some converts to Orthodoxy. Patient and gentle in answering his questions, they guided Fr. Martin on his own journey. His first experience in an Orthodox church came on the feast day of the Three Holy Hierarchs in 1994. After studying the faith as catechumens for 18 months, the Watt family were received into the Orthodox faith in the fall of 1995. They would welcome a son into their family and then head north to Dayton, Ohio and to St. Paul the Apostle parish. Fr. Martin would go on to complete a vocations program and be ordained to the Diaconate. His day job kept him busy to the point that he missed his family and he realized that he was being called to the holy priesthood. After six years on the road, Fr. Martin came home to his family and to the Orthodox priesthood. He was ordained on the feast of the Lord’s Transfiguration. Fr. Martin’s journey to Orthodoxy took him in several different directions. It ended with a trip to the East.